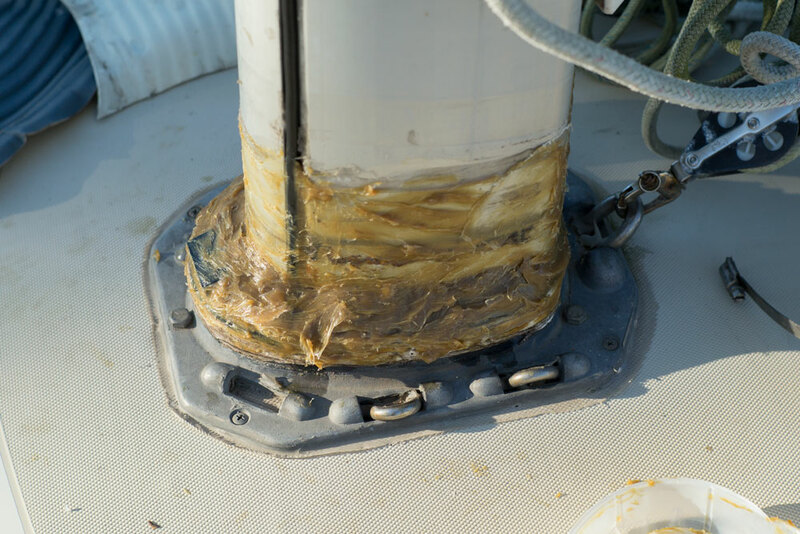 We’ve been fighting leaks in the boat since we purchased it more than two years ago, and despite liberal doses of silicone and several vinyl mast boots, the cabin top area around the mast still leaks like a sieve. We were looking at spending $150 on a molded rubber solution that came with mixed reviews from our friends who had attempted it. Then, several cruisers recommended a much simpler and cheaper solution. Wax toilet ring. They were $1.50 each at Home Depot. We bought two just to make sure we had enough to get around the entire mast. After tax our total expenditure was $3.23. 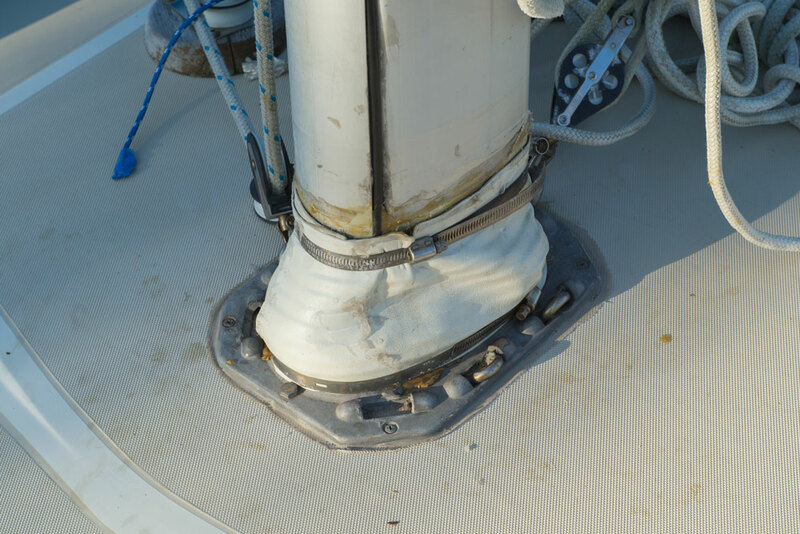 First we removed the worthless white West Marine universal mast boot. Even with that boot on there is still a waterfall in our salon when it rains. Underneath the boot there was basically just a huge gap between the mast and the deck with several rubber spacers poked into the hole. I just started squishing wax into every nook and cranny. I may have gone a little overboard, and I went a ways up the mast with the wax. It was messy, but in the end there is no way water is getting through. After cleaning off my hands I put the white boot back on to seal it up and keep wax from getting everywhere. 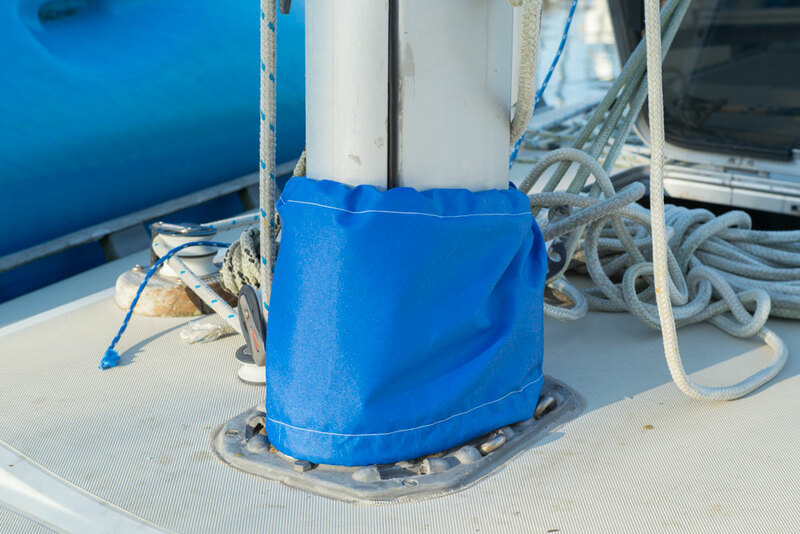 And to ensure that our boat looked beautiful, as well as being dry, I also sewed her a Sunbrella mast boot to cover everything. The boot is just a simple strip of canvas with a drawstring at the top and bottom. I will be listing it in the shop just in case someone wants one. Just include your boat color and mast circumference, and I can stitch one up for you. Doesn’t the wax melt in the hot Texas sun? 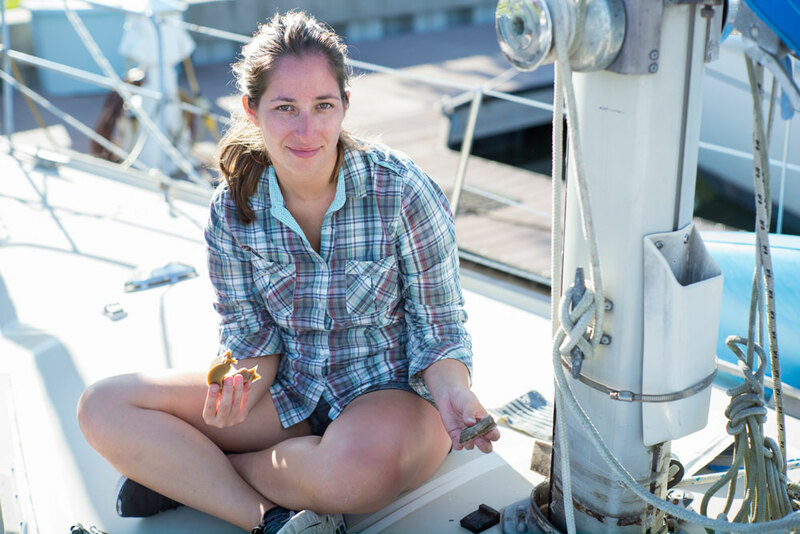 Did it solve your problem with leaks around the mast? 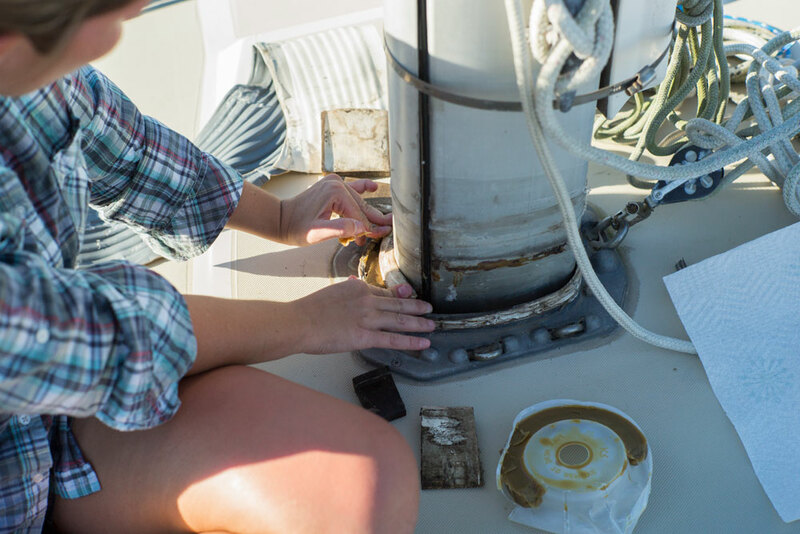 I have the same problem on my boat and am searching for a way to fix it – 4″ wide silicon tape (similar to Rescue tape but a different brand) worked briefly, but the leak is back. I would say the leak is 85% fixed. There is one spot where it is still dripping. I plan to go back and try to reseal in that one spot, but haven’t gotten to it yet. No problems with melting wax. The melting point of a wax toilet ring is 140 – 170 degrees fahrenheit. I am checking in on this solution now that a full season has gone by. How is it holding up? Did you stop the last small leak and is everything dry now? I need a good solution. Thanks. Well, it didn’t stand up to Hurricane Harvey. We may clean it all up and try it again this season.